Dental bridges are a common solution used to replace a missing tooth or teeth. Dentists in Broward County, FL at Stirling Dental have provided dental bridges to many residents in the county’s cities including Cooper City, Miramar, Pembroke Pines, Plantation, Davie, Lake Lucerne, Dania Beach, Carol City, Scott Lake, and Weston. Dental bridges are custom-made to match your natural teeth in color and overall appearance. They are made from mixtures of gold, metal, alloys or porcelain to ensure that they are strong and durable. With appropriate at home and professional care, your dental bridges will last for years. Bridges involve a two-step treatment process. 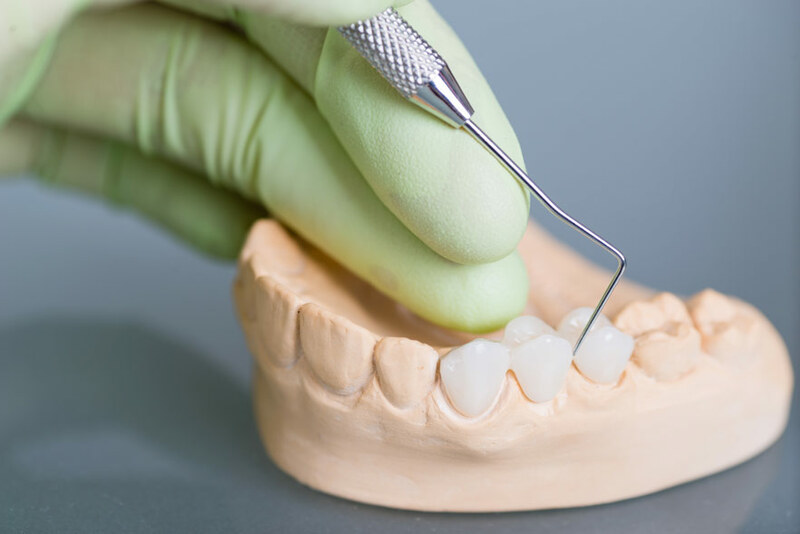 On the first visit for a dental bridge procedure, the teeth adjacent to a missing tooth or teeth will be prepped and used as anchoring teeth to support the replacement tooth. Preparation involves reshaping these teeth by removing a layer of enamel, which provides room for a crown to be positioned over top of them. Following, impressions of the teeth are taken and sent to the dental lab assistants, who will use the impression as a model from which they will construct the crowns, pontic, and bridge. While waiting on your final bridge to be produced, your dentist will create a temporary bridge to wear for the protection of the exposed teeth and gums. At the follow up visit, the temporary bridge is taken out and the final porcelain or metal bridge will be tested and adjusted to ensure a comfortable fit. Visits precluding the final fitting are subjective to each individual patient’s condition. Besides the aesthetic disadvantage of missing a tooth, if left untreated, structural changes to your mouth and jaw may occur, making it difficult to eat and speak properly. Additionally, it is important to replace missing teeth to avoid shifting of surrounding teeth, which can often lead to misaligned bite, TMJ and other dental problems. Our Cooper City dentists are committed to making sure your smile is healthy and beautiful. Please contact us for more information.